The Xenopus oocyte is a useful cell model to study Ca2+ homeostasis and cell cycle regulation, two highly interrelated processes. Here, we used antisense oligonucleotides to investigate the role in the oocyte of stromal interaction molecule (STIM) proteins that are fundamental elements of the store-operated calcium-entry (SOCE) phenomenon, as they are both sensors for Ca2+ concentration in the intracellular reservoirs as well as activators of the membrane channels that allow Ca2+ influx. Endogenous STIM1 and STIM2 expression was demonstrated, and their synthesis was knocked down 48-72 h after injecting oocytes with specific antisense sequences. Selective elimination of their mRNA and protein expression was confirmed by PCR and Western blot analysis, and we then evaluated the effect of their absence on two endogenous responses: the opening of SOC channels elicited by G protein-coupled receptor (GPCR)-activated Ca2+ release, and the process of maturation stimulated by progesterone. Activation of SOC channels was monitored electrically by measuring the Tin response, a Ca2+-influx-dependent Cl− current, while maturation was assessed by germinal vesicle breakdown (GVBD) scoring and electrophysiology. It was found that STIM2, but not STIM1, was essential in both responses, and Tin currents and GVBD were strongly reduced or eliminated in cells devoid of STIM2; STIM1 knockdown had no effect on the maturation process, but it reduced the Tin response by 15 to 70%. Thus, the endogenous SOCE response in Xenopus oocytes depended mainly on STIM2, and its expression was necessary for entry into meiosis induced by progesterone. For approximately three decades, the Xenopus oocyte has been a useful cell model to determine the underlying mechanisms responsible for the increase of the cytoplasmic Ca2+ concentration through its release from intracellular reservoirs , and by calcium influx either through Ca2+-dependent voltage-dependent channels or via store-operated Ca2+ (SOC) channels -. The latter results from the activation of the phenomenon known as store-operated Ca2+ entry (SOCE), which allows the replenishment of emptied reservoirs  after the stimulation of Ca2+ release through IP3/diacylglycerol synthesis by phospholipase C (PLC). Release of Ca2+ from intracellular reservoirs and SOCE activation are common responses in the Xenopus oocytes since they endogenously express the machinery that activates PLC by stimulating endogenous G protein-coupled receptors (GPCR); cytoplasmic Ca2+-increase, through either release or influx, opens Ca2+-dependent Cl− channels in the oocyte membrane generating conspicuous current responses . SOCE activation in the membrane of the Xenopus oocyte was first detected by measuring the transient inward (Tin) current response  after Ca2+ release in the oocyte. The Tin response is generated by hyperpolarizing steps, and is mainly due to the Ca2+-influx that subsequently opens Ca2+-dependent Cl− channels; this membrane response has been used as a reliable monitor of SOC channel activation ,. The SOCE current is most likely driven through Ca2+-permeable channels formed by Orai, a channel activated by association with the stromal interaction molecule (STIM) , a protein that is localized mainly in the endoplasmic reticulum (ER) membrane and that senses the Ca2+ concentration in its lumen . Although transcripts for endogenous Orai and STIM molecules have been reported in the oocyte , the role for the different types and isoforms of these proteins and their relation with endogenous responses in the oocyte have not been thoroughly studied; these issues are of interest given that the roles for the different SOC molecular elements are also incompletely understood, and their study in a well-known model such as the Xenopus oocyte might reveal important information. Two STIM proteins, STIM1 and STIM2, are expressed in eukaryotic cells . A different role for each of them has been proposed; for example, the ER Ca2+ content must be greatly reduced in order to activate STIM1 protein, while the more Ca2+-sensitive STIM2 seems to require only a slight reduction in ER Ca2+ concentration -. It has been proposed that STIM2 participates in maintaining the cytoplasmic Ca2+ concentration -. Although the fundamental role of STIM1 in activating SOCE has been demonstrated in several cell types -, other information indicates that STIM2 is the main protein involved in SOCE generation in neurons, dendritic cells, and mammary epithelial cells -. Thus, it is plausible that the specific functions of STIM1 and STIM2 depend on the cell type, their relative rates of expression, and other factors such as interactions among them or with regulatory proteins. It has also been shown that during maturation, the Ca2+-signaling pathway in the oocyte is significantly reconfigured, probably as part of the mechanism that prepares the gamete for fertilization and subsequent embryonic development. This reconfiguration includes Orai1 channels and STIM1, which are regulated during maturation thus eliminating the SOCE response -. Due to the importance of this phenomenon for cell cycle control in general, it is also of interest to explore the effects on oocyte maturation of altered STIM expression ,. In the present study, we specifically knocked down STIM1 or STIM2 in the Xenopus oocyte to analyze the effect on two endogenous phenomena, the generation of the Tin current response (i.e., SOC channel activation) and the maturation process. We found that STIM2 expression was essential in both phenomena, while STIM1 expression was not. Xenopus laevis frogs were obtained from Xenopus I (Ann Arbor, MI, USA). Ovary lobules  were surgically removed under sterile conditions from frogs that had been anaesthetized using 0.1% aminobenzoic acid ethyl ester and rendered hypothermic. After surgery, frogs were sutured and allowed to recover from anesthesia. Frogs were maintained for 3-7 days in individual tanks until healing was complete; they were then housed in larger groups, and no further oocytes were taken from them for at least 2 months. Procedures were approved by the institutional animal committees (INB-UNAM). The lobules were placed in sterile Barth’s solution containing (in mM): 88 NaCl, 1 KCl, 2.4 NaHCO3, 0.33 Ca(NO3)2, 0.41 CaCl2, 0.82 MgSO4, and 5 HEPES, with 75μg/ml gentamicin and adjusted to pH 7.4. Studies were carried out using oocytes at stage VI  dissected from the ovaries and defolliculated by collagenase (1 mg/ml) treatment at room temperature for 30 min in normal frog Ringer’s solution (NR, containing in mM: 115 NaCl, 2 KCl, 1.8 CaCl2, 5 Hepes, pH 7.0). After washing, the oocytes were stored at 18°C in sterile Barth’s solution, and electrical recordings were performed over a period of 2-4 days in either uninjected oocytes or in those injected with cRNA for specific receptors and/or with antisense oligonucleotide to knock down specific proteins. Total RNA from the oocytes was purified using Trizol Reagent (Life Technologies). First-strand cDNA was synthesized using 2μg of DNase-treated RNA as template and 1μg of oligo (dT), 0.25μg random hexamers, and reverse transcriptase. The cDNA was used as template in a polymerase chain reaction to amplify cDNA fragments for stim1 and stim2, and the ribosomal protein S2 (rps2) was used as a control. All the PCR programs started at 95°C for 2 min. The amplification in the 35°Cycles consisted in 45’s at 95°C, 40’s at 55°C, and 35’s at 72°C, and a final extension at 72°C for 5 min. The sequences of oligonucleotides used were: stim1, forward, 5'-CGACGAGTTTCTCAGGGAAG-3' and reverse, 5'-CTTCATGTGGTCCTCGGAGT-3'; stim2, forward, 5'-CCAGCCTTGAGGCAATATGT-3' and reverse, 5'-GCAACCTCCAACTCCGATTA-3'; rps2, forward, 5'-TGGTAACAGGGGAGGTTTCCGC-3' and reverse, 5'-ATACCAGCCATCATGAGCAGC-3'. The amplified products were isolated, purified (QIAEX II, QIAGEN, Hilden, Germany), and subcloned into the pJET 1.2 vector (Thermo Fisher Scientific Inc., Waltham, MA). Finally, their nucleotide sequences were confirmed by Sanger sequencing (ABI PRISM 310 Genetic Analyzer, Applied Biosystems). Protein expression was assessed by Western blot in either control oocytes or in those injected with as-STIM1 or as-STIM2. For each group, 10 oocytes were homogenized 72 h post-injection in a buffer containing (in mM): 20 Tris-HCl pH 7.6, 1 EDTA pH 8, 80 sucrose, and 1X complete mini protease inhibitor (Hoffmann-La Roche, Switzerland). Then samples were centrifuged at 4°C and 500 rpm for 5 min, at 3500 rpm for 10 min, and at 14,000 rpm for 20 min. Subsequently, the final pellets were resuspended in 50μl of buffer containing (in mM): 50 Tris-HCl pH 7.6, 1 EDTA pH 8, 100 NaCl, 100 MgCl2, and 1X complete mini protease inhibitor. Total membrane protein concentration was quantified with a Bradford assay. For electrophoresis, samples (1.5μg per lane) were fractionated in a 10% SDS-polyacrylamide gel and transferred to a nitrocellulose membrane (BioRad, Hercules, CA, USA). Membranes were blocked for 1 h at room temperature in TBS-T solution (in mM): 150 NaCl, 20 Tris, pH 7.4, and 0.1% Tween 20, containing 5% nonfat dry milk and then incubated overnight at 4°C with a 1:1000 dilution of rabbit primary antibody. The antibody denoted NH-STIM1 (Alomone, Jerusalem, Israel) was directed against a region of the amino-terminus of the STIM1 protein, and the antibodies denoted NH-STIM2 (Alomone, Jerusalem, Israel) and COOH-STIM2 (ProSci Inc., Poway CA, USA) were against the amino and carboxy termini, respectively, of STIM2. Western blot analysis was also used to detect SERCA2 expression, used as a loading control (antibody from Cell Signaling Technology Inc. Danvers, MA, USA). After incubation, the membranes were washed with TBS-T and incubated for 45 min at room temperature with HRP-conjugated goat anti-rabbit antibody (Life Technologies) in TBS-T. The immunoreactive proteins were detected by chemiluminescence, and analyzed with ImageJ Software (NIH, USA); the results were normalized against the control condition and expressed in optical density units. To analyze loading controls such as SERCA2, the same membranes used to detect STIM proteins were incubated for 30 min in striping solution (in mM): 50 Tris pH 6.8, 100 β-mercaptoethanol, and 2% SDS at 55°C and then washed twice with TBS-T. Then the membranes were treated with a primary antibody against the SERCA2 protein and finally with an HRP-conjugated goat anti-rabbit antibody (Life Technologies) in TBS-T and quantified as above. In order to express the desired membrane receptors, cDNA coding for P2Y2, P2Y8, or M1 receptors were cloned into the plasmid pEXENEX1 and linearized with SalI or HindIII, then purified and transcribed to capped RNA with T7 polymerase using the mMESSAGE mMACHINE kit (Life Technologies CA, USA). Oocytes were injected with 25-50 ng of the respective cRNA (1 ng/nl). For purinergic receptors the P2Y8 Xenopus laevis [cDNA clone MGC: 52559, Source BioScience Nottingham, UK], and the P2Y2 Xenopus tropicalis [cDNA clone IMAGE 5383884, ATCC Manassas, USA] subtypes were used, and for muscarinic receptors, the M1 subtype [human cDNA Clone ID IOH56940 (Life Technologies CA, USA)]. Another group was injected with 25-50 nl of H2O for control experiments. The antisense sequences were designed to target the initiation translation region, a strategy that has been successfully used in several experimental protocols; antisense oligonucleotide strongly inhibits mRNA expression via an RNAse-H-dependent mechanism . Expression of endogenous STIM1 or STIM2 was knocked down by the injection of 25-50 ng of antisense oligonucleotides with the following sequences: for antisense oligonucleotide STIM1 (as-STIM1), 5‘-ATAGCAGAGTCCGACACCAAAGCATTCCGC-3’, and for antisense oligonucleotide STIM2 (as-STIM2), 5‘-TCCTCTTCTTCTTTCTCCCGTTCATGGCTG-3’. Control experiments for antisense oligonucleotides were performed injecting (50 ng per oocyte) scrambled sequences for both as-STIM, and a second control for antisense oligonuleotide injection (as-Cx38) was made knocking down the expression of connexin 38 (Cx38) which was monitored measuring the Ic current in Ca2+-free Ringer solution , the sequence for as-Cx38 was: 5‘-GCTTTAGTAATTCCCATCCTGCCATGTTTC-3’. In general, after injection, oocytes were incubated at 18°C in Barth’s solution, and the effects of these procedures on protein expression and current responses were examined by biochemical and electrophysiological methods. Unless otherwise stated, groups of injected oocytes that were induced to express purinergic receptors were incubated in Barth’s solution containing 5 U/ml apyrase to hydrolyze the ATP that is released from the oocyte into the medium, thus avoiding stimulation of purinergic receptors during the incubation period . Oocyte membrane currents were monitored using the two-electrode voltage-clamp technique. The cells were continuously superfused (10 ml/min) with NR solution and held at −10 mV. Voltage steps to −100 mV with a duration of 4’s were applied every 40’s to activate the Tin current response, and the oocytes were stimulated for 120’s (acute protocol stimulation) with one of the agonists (100μM ATP or ACh, or a 1:1000 dilution of FBS) added to the bath solution. For long-lasting stimulation, GPCR-expressing oocytes were incubated for 1-4 h with 1μM agonist, and P2Y8- or P2Y2-expressing oocytes were incubated in medium devoid of apyrase; in this condition, endogenously released ATP activated the receptors in most cases. Intra-oocyte injection of antibodies during electrophysiological recording was achieved by pneumatic pressure ejection from a third micropipette . The injection micropipette was loaded with antibody dissolved in 5 mM HEPES, adjusted to pH 7.0 with KOH. Maturation studies were carried out on batches of 15-25 defolliculated oocytes, stage VI, incubated in 2 ml of Barth’s solution plus 10μM progesterone. GVBD was scored by white-spot formation and confirmed by cutting the oocytes through the equator after incubating them in hot NR for 1 min . Maturation was analyzed in groups of oocytes that had been injected 72 h earlier with as-STIM1 or as-STIM2, and they were compared with uninjected oocytes or those injected with H2O. Electrical properties of oocytes from the different groups were analyzed after 9-12 h in the presence of progesterone. ATP, ACh, apyrase, collagenase type I, progesterone, FBS, and all salts were from Sigma Chemical Co. (St Louis, MO, USA). All data are expressed as mean±SEM of at least 10-15 oocytes from three different frogs for each condition. Statistical analysis was performed using the Igor Pro Wavemetrics, Inc. software through analysis of variance (ANOVA). The means of two different experimental groups were compared using a Student’s t-test. Differences were considered to be significant at p <0.01. Expression of RNA transcripts stim1 and stim2 was determined in oocytes using RT-PCR. In RNA samples from control (non-injected) oocytes (Figure 1A) the use of oligonucleotide primers for stim1 resulted in an amplicon of 463 bp, while stim2 primers amplified a fragment of 494 bp. Both had the expected size for the corresponding transcript, and the amplified fragments were then cloned into the pJET 1.2 vector, sequenced, and analyzed using BLAST. The sequences obtained were highly homologous to those reported for stim1 (99%) from Xenopus laevis [GenBank: NM_001097037.1] and for stim2 (90%) from Xenopus tropicalis [GenBank: XM_004916759.1] (Additional file 1). Control amplifications without RT or without a cDNA template did not produce any PCR products (Figure 1A). Groups of oocytes that had been injected 48-72 h earlier with either the as-STIM1 or the as-STIM2 oligonucleotide sequences showed a dramatic decrease in the corresponding transcripts. STIM expression in the Xenopus oocyte and its downregulation by as-STIM injection. A) shows the RT-PCR amplification of products that corresponded to the size expected for either stim1 or stim2 in native oocytes (CNT); the corresponding amplicons were absent in oocytes from the same batch that had been injected with either as-STIM1 or as-STIM2 48 h before the assay. The rps2 amplicon indicates the reaction efficiency, and -RT and H2O lanes correspond to negative controls, either RNA without RT, or to the reaction mix without a cDNA template, respectively. B) STIM1 and STIM2 were identified by Western blot analysis in protein extracts from oocytes (Oo) or mouse brain (MB, positive control) using either NH-STIM1 (left panel) or COOH-STIM2 (right panel) as antibody. C) A similar analysis as in B was made for batches of oocytes injected with H2O as control (CNT), or with as-STIM1 or as-STIM2 48 h before the protein extraction, in which cases proteins were eliminated. (in all cases 10 oocytes per condition). To determine whether the injection of antisense oligonucleotides induced a parallel reduction in level of STIM1 and STIM2 proteins, these were evaluated using Western blot analysis with specific antibodies (Figures 1 and 2). As expected, NH-STIM1 detected a band above 75 KDa in total membrane fractions from control oocytes, and from the mouse brain (Figure 1B) ,. Then, a group of oocytes injected with as-STIM1 was tested; as illustrated in Figure 1C, antisense-injected oocytes showed a significant STIM1 decrease compared to the control group. Knockdown of STIM expression in oocytes co-injected with GPCR mRNA. A) RT-PCR amplification of stim1, stim2, or rps2 in batches of oocytes injected with H2O (CNT) or with cRNA (50 ng per oocyte) coding for either P2Y8 or M1 GPCR. In oocytes co-injected with as-STIM1 or as-STIM2 (50 ng per oocyte) together with P2Y8 or M1 cRNA, the corresponding STIM amplicon was downregulated. Control reactions illustrate specificity; rps2 amplicons are positive controls, and -RT and H2O lanes show negative controls. B) Similar groups of oocytes as in A) were assayed using the Western blot technique; in this case oocytes from the same donor injected with one GPCR mRNA (P2Y8 or M1) alone, or co-injected with as-STIM1, were tested with NH-STIM1, while as-STIM2-injected oocytes were probed with COOH-STIM2. In both as-STIM groups SERCA was used as gel-loading control. C) The graph shows the densitometric analysis of bands, summarizing the results obtained in different preparations of 10 oocytes per group and repeated in 3-5 frogs. Both PCR products and bands detected by Western blot (WB) were analyzed for batches of oocytes injected with H2O (CNT) or with either 50 ng as-STIM1 or as-STIM2 alone (native group). Similar analysis was made for batches of control oocytes injected with P2Y8 or M1 cRNA alone, and oocytes from the same frogs co-injected with either as-STIM or as-STIM together with the GPCR cRNA. Optical density units (ODU) for each band were normalized against the value obtained in the corresponding CNT conditions (*p<0.01). Similarly, STIM2 was detected using two distinct antibodies, COOH-STIM2 (Figures 1B-C) and NH-STIM2, which revealed STIM2 as a band about 100 KDa, in both the total membrane preparation of control oocytes and in total protein from mouse brain, in agreement with previous reports ,. Western blot analysis in oocytes injected with as-STIM2 indicated that antisense produced a large decrease in the amount of STIM2 as compared to control oocytes (Figure 1C). These results showed that the antisense sequences used specifically decreased the endogenous transcripts for stim1 or stim2, with a concomitant depletion of STIM1 and STIM2 proteins. Most of the following experiments were made using oocytes exogenously expressing muscarinic or purinergic receptors due to injection of the respective cRNA in order to get a robust and consistent response; therefore, it was determined if GPCR expression affected either the endogenous expression of STIM or its decrease due to as-STIM injection. Seventy-two hours after injection with cRNA coding for GPCR, oocytes exhibited strong current responses in the presence of their respective agonists (see below); this GPCR expression did not affect the level of stim1 or stim2 transcripts, as illustrated in Figure 2A. Moreover, the decrease of stim1 or stim2 expression due to antisense injection was also not affected in oocytes that were co-injected with either P2Y8 or M1 receptor cRNA (Figure 2A). Consistent with this result, knockdown of neither STIM1 nor STIM2 protein was altered by co-injecting oocytes with cRNA to express GPCR, as shown in Figure 2B. In all cases, SERCA2 (114 KDa, used as the loading control) did not show significant changes in response to the various experimental conditions (Figure 2B). The results obtained for all conditions described above are summarized in Figure 2C. Taken together, they confirm that antisense knockdown of endogenous STIM proteins in the oocyte was specific and effective and that this was not affected by simultaneous exogenous GPCR expression. To evaluate the role of STIM1 and STIM2 in SOC current activation, we monitored the Tin response generation. Prior to this analysis we tested whether or not as-STIM injection affected the Ca2+-dependent Cl− oscillatory current (Iosc) generated by the first application of one of the agonists (Figure 3A). For this, groups of oocytes were exposed to either FBS (stimulation of the endogenous LPA receptor (LPAR)) , ACh, or ATP in order to monitor the Iosc amplitude, as a measure of the oocyte capacity to release Ca2+ from intracellular reservoirs ,-. Iosc elicited by FBS were recorded from native oocytes, and those generated by ACh or ATP were recorded from oocytes expressing M1 or P2Y receptors. The Iosc amplitude was then compared among control oocytes and oocytes co-injected with as-STIM1 or as-STIM2. The results showed no significant difference among the various groups of oocytes tested for a particular agonist (Figure 3A), although average current amplitude was consistently smaller for LPAR stimulation, and larger for M1-stimulated responses. Together, these results showed that the injection of antisense oligonucleotides did not affect Iosc activation, strongly suggesting that the Ca2+-release mechanism remained intact and showing that its strength was dependent on the receptor type stimulated. I osc and T in responses activated by agonist stimulation. A) Strength of Iosc elicited by first agonist application did not change by knockdown of STIM1 or STIM2, compared with that obtained in CNT oocytes; top traces are typical responses elicited by ACh, similar responses were obtained by FBS or ATP applications, and the graph shows the average Iosc responses obtained in oocytes held at −60 mV. B) Record illustrating the activation of Tin current obtained in an oocyte expressing the M1 receptor by a single ACh (100μM) application for 40’s (acute protocol). Oocytes were held at −10 mV while being superfused with NR solution and stepped to −100 mV for 4’s every 40’s; sudden hyperpolarization generated Tin current responses that follow consistent kinetics with a peak amplitude response at 280-360’s (c); after that the response was washed out with a similar time course. C) Shows the Tin current during the steps from −10 to −100 mV indicated with letters in panel B). D) A similar Tin current response elicited in an oocyte from the same frog that was pre-incubated with 1μM ACh for 4 h (long-lasting protocol), then monitored with the same electrical recording parameters and stimulated with 100μM ACh. E) Shows the Tin responses indicated with the same letters as in D). In this protocol Tin current was consistently activated from the beginning of the record, and a transient inhibition of the response was noted during application of the agonist (b); after that, Tin recovered and remained fully activated for a long period of time. Similar responses were obtained using oocytes expressing P2Y receptors and stimulating with ATP. To analyze the role of STIM1 and STIM2, Tin current was monitored by applying hyperpolarizing voltage steps of −90 mV every 40-60’s, from a holding potential of −10 mV (Figure 3B-E). As illustrated in Figure 3B, the Tin current amplitude generally increased after acute agonist application (either ATP, ACh, or FBS for 120’s), reached a peak after 400-480’s, and then slowly returned to basal levels after 680-800’s (65 oocytes, 12 frogs). Consistent with previous studies , Tin was a Cl− current that was dependent on extracellular Ca2+, and it was blocked by lanthanides with an IC50 for La3+ of 41±0.21 nM and for Gd3+ of 7±0.23μM, potencies similar to those shown to block SOC channels in other studies ,,. Then the effect of as-STIM1 injection on Tin current generation (121 oocytes, 9 frogs) was assessed. In control oocytes, application of FBS (1:1000) elicited Tin current responses of 2.5±0.28μA (Figure 4A-B). However, in as-STIM1-injected oocytes, the average Tin generated was 0.92±0.38μA, which represented a decrease of 60±5.2%. Similarly, oocytes exposed to 100μM ACh (expressing M1 receptor) showed a 70±9.7% decrease in Tin in the as-STIM1-injected group. However, oocytes expressing P2Y8 and exposed to 100μM ATP exhibited a 20±1.4% decrease in Tin and oocytes expressing P2Y2 exhibited a reduction of only 15±1.5% (Figure 4B). The results clearly indicated that elimination of STIM1 did not cause a complete loss of the Tin response elicited by any of the agonists used. Specific STIM knockdown by oocyte injection of as-STIM differentially decreased the T in current. A) Oocytes induced to express M1, P2Y8, or P2Y2 receptors were stimulated with either ACh or ATP (100μM), and LPAR in native oocytes were stimulated by FBS (1:1000 dilution); the resulting Tin currents (CNT, gray areas) were compared with the Tin obtained in oocytes from the corresponding group that were also injected with 50 ng as-STIM1 (superimposed black traces); all responses were monitored 48-72 h after oocyte injection. B) The graph shows the results obtained using the different experimental conditions illustrated in A). C) In a set of experiments similar to those shown in A), Tin currents were monitored, and the peak amplitudes of non-injected CNT oocytes were compared with those of oocytes injected (48-72 h before recording) with 50 ng as-STIM2 and stimulated with the agonists. D) The graph shows the results obtained using the different experimental conditions illustrated in C). Bars correspond to the mean (± SEM) of the Tin peak amplitude of 10-15 oocytes from 5-6 frogs (*p<0.01, as-STIM vs. CNT). We next tested whether STIM2 knockdown affected Tin currents activated either by P2Y or M1 receptors with experiments similar to those described above. In contrast to what happened with STIM1 knockdown, as-STIM2 injection drastically reduced the Tin response elicited by the acute stimulation of any of the receptors tested (Figure 4C-D). Tin current amplitude was reduced by 96±6.6% in oocytes stimulated with FBS, by 96±3.6% with ACh, by 93±7.1% with ATP for oocytes expressing P2Y8 receptors, and by 94±8% for those expressing P2Y2. In this case, the amount of decrease observed did not differ among the receptors studied (Figure 4D). As shown above, it was evident that the decrease in the Tin response was not due to uncoupling of the IP3/Ca2+-release system since the oscillatory responses in all the oocyte groups remained unchanged. Control experiments were also made using scrambled oligonucleotide sequences as well as as-Cx38 a different antisense oligonucleotide sequence to rule out the possibility that injection per se yielded nonspecific results, in these cases no effects were observed on Tin current amplitude. For example, as-Cx38 was used to knockdown connexons formed by Cx38, whose opening by superfusion of Ca2+-free Ringer’s solution , results in a fast and reliable test for Cx38 expression. Thus, in control oocytes the Ic current response was elicited by superfusion of Ca2+-free Ringer’s solution (3.06±0.16μA; 9 oocytes, 3 frogs) while in as-Cx38 injected oocytes the current response was eliminated. 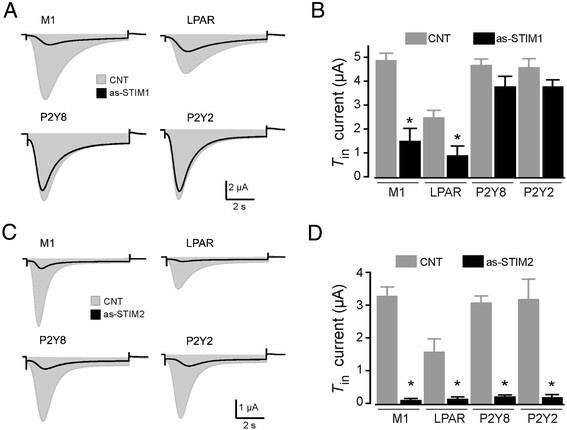 However, in the same oocytes from both groups, the Tin current amplitude was similar, regardless the membrane receptor stimulated, either M1 (2.98±0.17μA vs. 2.95±0.18μA) or P2Y8 (3.14±0.14μA vs. 3.15±0.15μA) (16 oocytes, 4 frogs). All together, these results indicate that Tin generation in the Xenopus oocyte requires STIM2 protein. Envisioning that specific binding of antibody to STIM1 or STIM2 might affect the function of these proteins and then serve as a specific tool to evaluate the involvement of STIM in a particular response, we tested the same antibodies used in the Western blot for their effect on Tin generation. For this purpose, antibodies were microinjected into the oocyte cytoplasm to reach a final dilution of 1:1000. Figure 5 shows that ACh application onto oocytes pre-loaded with COOH-STIM2 resulted in a robust potentiation of the Tin response, increasing the amplitude by 158±25% (15 oocytes, 5 frogs). COOH-STIM2 injection also potentiated by 168±30% the Tin responses elicited by FBS, and a similar effect was observed in oocytes stimulated through the P2Y8 (126±37%) or the P2Y2 receptor (129±23%) (Figure 5). However, in oocytes (n=22) from the same frogs that were injected with denatured COOH-STIM2 (incubated for 10 min at 70°C), Tin potentiation was completely abolished (Figure 5B). Also, injection of NH-STIM1 or NH-STIM2 antibody did not produce any changes in the Tin response, nor did the injection of a P2Y2 antibody. Oocyte injection with COOH-STIM2 antibody produced a strong potentiation of T in current response. A) Tin current responses were monitored in two conditions: non-loaded oocytes (CNT) and oocytes loaded with COOH-STIM2 antibody (ab-loaded). Tin responses were elicited by ACh, FBS, or ATP application, depending on the receptor to be stimulated. In all cases, a strong potentiation of the response was observed in ab-loaded oocytes. B) Oocytes stimulated by ACh (M1) loaded with denatured COOH-STIM2 had control-like responses, while NH-STIM2 or NH-STIM1 loading did not produce Tin potentiation. C) The graph shows the results obtained using the different experimental conditions illustrated in A and B; each bar corresponds to the mean (± SEM) of the Tin peak amplitude normalized against the CNT current of 10-15 oocytes from 3-6 frogs (*p<0.01). All these results clearly indicated that the COOH-STIM2 antibody specifically potentiated the Tin current, regardless of the receptor stimulated. The following experiments were designed to explore the possibility that STIM1 and STIM2 have different effects, depending on the duration of the stimulus. Thus, oocytes injected with as-STIM1 or with as-STIM2 and expressing M1, P2Y8, or P2Y2 receptors were incubated for 1-4 h in the presence of their respective agonists at 1μM (Figure 3D-E). Extended agonist incubation generated strong Tin currents that remained stable for more than the 60-min recording time, even under constant superfusion of the oocytes with NR solution, and it began to decrease after 120-180 min of wash; we assumed that in this condition the SOC machinery was over-stimulated, and that the time spent in the activated state reflected the time necessary to refill the reservoirs. In the oocytes knocked down for STIM1, Tin currents activated by long-lasting stimulation with any of the agonists analyzed were no different from those observed in control oocytes. In contrast, in oocytes injected with as-STIM2 and expressing P2Y or M1 receptors that had been stimulated for long intervals with their respective agonists, the Tin current was no longer generated (10-15 oocytes in each group, 5 frogs), strongly suggesting that STIM2 in the oocyte was essential for responses generated through both the acute and long-lasting stimulation protocols. During the maturation process, molecular elements that control the Ca2+ dynamics in the Xenopus oocyte undergo an important reconfiguration; this observation has been extended to different species, and similar changes are known to occur during mitosis ,,. Given the importance of these events for cell cycle control, we asked whether or not the knockdown of STIM proteins affected the maturation process. Thus, batches of control oocytes, and those that were injected with as-STIM1 or as-STIM2 were assayed 48-72 h after injection with 10μM progesterone in Barth’s solution to induce maturation. Oocyte maturation entry was scored by the appearance of GVBD after 8-12 h in the presence of progesterone. The GVBD score obtained was compared against progesterone-treated control oocytes. The results are illustrated in Figure 6A; as-STIM1-injected oocytes did not show any effect on the efficiency of maturation, while STIM2 knockdown produced a strong inhibition of the process (the experiment was repeated in oocytes from 3 different donors). Lack of GVBD in as-STIM2-injected oocytes seemed to indicate a failure to enter meiosis and a consequent incomplete maturation process; this interpretation was also supported by monitoring electrophysiological parameters in all of the groups tested. As illustrated in Figure 6B-C, electrical parameters of as-STIM2-injected oocytes (progesterone-treated) were different from those displayed by as-STIM1-injected oocytes and control oocytes maintained in progesterone for the same period of time. Effect of as-STIM2 on GVBD and oocyte membrane characteristics during maturation induced by progesterone. A) The maturation process promoted by progesterone (10μM) was analyzed in uninjected oocytes, or in oocytes injected 72 h prior to the assay with either as-STIM1 or as-STIM2, and compared with control oocytes in the absence of progesterone. GVBD was quantified after 8-12 h in presence of progesterone (10 oocytes per group, repeated using 3 different frogs) and is normalized against the value observed in uninjected oocytes. B) Resting membrane potential was monitored 8-12 h after addition of progesterone in the same groups of oocytes (n=3-5, repeated in 3 frogs) as in A). C) The input membrane resistance (Rϕ) was estimated over the range from −80 to −20 mV in the different oocyte groups treated in the same conditions. Control groups, without progesterone, included both uninjected and antisense-injected oocytes. In all cases, values for as-STIM2-injected groups were different from as-STIM1-injected or uninjected groups (*p<0.01). Taken together, these results clearly showed that in oocytes where STIM2 was knocked down, the process of maturation was inhibited at some early point. The first manifestation of this was the complete blockage of GVBD, i.e., of the signal for meiosis entry; this result was clearly different from that observed in STIM1-deprived oocytes. Here, using biochemical strategies and electrophysiology, we studied what effects the knockdown of endogenous STIM proteins had on two important Xenopus oocyte responses: the activation of SOCE monitored by measuring Tin current generation, and the maturation process induced by progesterone. We found that: i) Both STIM1 and STIM2 proteins were endogenously expressed in the Xenopus oocyte; ii) Injection of antisense oligonucleotide sequences of STIM1 or STIM2 potently knocked down the expression of both the corresponding mRNA and the protein; iii) STIM1 or STIM2 knockdown did not seem to affect the Ca2+-signaling machinery responsible for generating oscillatory Ca2+-signals in the oocyte; iv) STIM2, but not STIM1, proved to be fundamental for Tin current generation; this was observed both in acute stimulation protocols or after long-lasting stimulation periods, and it did not depend on the receptor type stimulated; v) STIM2 protein knockdown blocked entry into the process of maturation induced by progesterone, while STIM1 elimination did not affect this process; and vi) an antibody against the COOH terminus of STIM2 potentiated Tin current generation. Calcium release and influx are two phenomena well studied in the Xenopus oocyte. The main subject addressed here is the identity and role of STIM proteins during calcium influx stimulated through endogenous responses. It is known that after GPCR stimulation, both endogenous as well as exogenously expressed GPCR generate in the oocyte mainly two Ca2+-dependent Cl− ion currents, one due to intracellular Ca2+ release that is normally followed by another current dependent on Ca2+ influx; this pattern is generated through an enzymatic cascade involving IP3 synthesis, a common mechanism in most cell systems . Following the original nomenclature, in the oocyte the first response is named Iosc, while the second generates the Tin current response . The Ca2+-influx magnitude is directly related to the amplitude of Ca2+-release; the main molecular element responsible for this linkage is the STIM protein, since it is the Ca2+-sensor within the Ca2+ reservoir. As in previous studies ,,, to monitor the [Ca2+]i increase produced by both mechanisms in the oocyte, here we used the Ca2+-dependent Cl− current as an endogenous sensor whose amplitude accurately reflects the concentration of Ca2+ beneath the plasmatic membrane. This is especially true for Ca2+ influx, since this occurs in the plasma membrane where the Ca2+-dependent Cl− channels are co-expressed with the SOC channels responsible for the influx. Thus, monitoring an endogenous Ca2+ sensor such as the Cl− channel offers not only spatial and temporal advantages, but also amplifies the normally small Ca2+ current through SOC channels and avoids altering the Ca2+ dynamics with further pharmacological manipulations. STIM protein expression and function was then studied in the Xenopus oocyte using this tool. It is well known that when Ca2+ is released from the ER, STIM proteins are activated, rapidly translocated, and oligomerized into junctions formed between the ER and the plasma membrane, where they bind to and activate highly selective Ca2+ channels formed by Orai proteins that allow Ca2+ influx ,. The main trigger for this phenomenon is a decrease in ER Ca2+ content; however, evidence indicates that isoforms of STIM2 protein might maintain a basal activation of Orai channels without prior Ca2+ release, thereby controlling the cytoplasmic Ca2+ concentration ,. The ratio of STIM1 to STIM2 expression seems to depend on the cell type, and perhaps on the pathophysiological state; as shown here for the Xenopus oocyte, other cells such as T cells, myoblasts, skeletal muscle, and liver cells also co-express both STIM proteins ,-. Studies to distinguish the roles of STIM1 and STIM2 in various cells have employed diverse silencing strategies and overexpression. The injection of an antisense oligonucleotide sequence for each STIM protein was chosen here for its simplicity and because it excludes potential non-specific effects caused by protein over-expression. The effect of antisense injection on STIM expression was demonstrated by analyzing both its mRNA and protein expression by RT-PCR and Western blot, respectively. This analysis demonstrated that expression of STIM1 or STIM2 was strongly downregulated in oocytes injected with the corresponding antisense oligonucleotide sequence. This antisense effect was not affected by co-expression of GPCR proteins, used experimentally to stimulate Ca2+-release. Also, it was shown that STIM protein knockdown did not affect the IP3 increase and subsequent Ca2+ release, as indicated by the Iosc amplitude responses evoked at the beginning of each experiment by acute application of one of the agonists studied. In addition, preliminary results using RT-PCR showed amplification of transcripts for Orai1 and Orai2 in the oocyte (not shown). Oocytes injected with either antisense STIM1 or STIM2 were then monitored to analyze their ability to generate Tin current using two stimulation protocols. In the first, acute application of the agonist produced the typical Iosc response; in control conditions it was followed by Tin generation that declined after 680-800’s. In the second protocol, long-lasting (1-4 h) stimulation of control oocytes with a low concentration of agonist (1μM) gave strong Tin current responses that remained active for 60-180 min, even in constant superfusion with NR solution. A possible explanation for this difference in response kinetics is that prolonged stimulation produced a stronger activation of the SOCE mechanism, probably due to a more marked decrease in ER Ca2+ concentration. Both protocols were applied in oocytes in which STIM1 or STIM2 expression had been eliminated. The STIM2 knockdown produced a severe decrease in Tin current generation (93 - 100%) in both stimulation protocols, indicating that STIM2 was indispensable to induce the Tin current response. Using acute receptor stimulation, elimination of STIM1 caused a smaller but significant decrease in Tin current generation thus, STIM2 alone was unable to support full Tin activation during acute stimulation, suggesting that an association of STIM2 with STIM1 was necessary in order to activate the endogenous response. Also it was observed that STIM1 requirement seemed to be minor during P2Y purinergic stimulation, this difference cannot be explained by the amplitudes of Iosc generated by the agonists, given that ACh and LPA were the more and less effective, respectively, in generating the response, and both agonists showed similar patterns of Tin decrease by STIM1 knockdown. Thus, this result might indicate some type of molecular specificity, perhaps intrinsic to the molecules involved or as a consequence of their differential expression and localization in the oocyte membrane. Differential insertion of several proteins expressed in the oocyte membrane has been demonstrated; thus, membrane domains with greater expression of STIM2 together with P2Y receptors are plausible. A central role for STIM2 protein in SOCE generation has been shown before in some cell types such as neurons , and dendritic cells ; however, there is no information indicating whether or not the expression of STIM1 might affect the full endogenous response in these cases. For example, it has been shown the essential role of STIM2 in SOCE activation in dendritic spines , which was not substituted by overexpression of STIM1. The authors concluded that this is due to differences in STIM-Ca2+ sensitivity and subcellular localization of the proteins. In many other cell systems, co-participation or complementary roles for the two STIM proteins have been postulated ,. Finally, when the oocytes were stimulated using the long-lasting protocol, elimination of STIM1 had no effect indicating that, in this case, the Tin current was activated by STIM2 alone. The central role for STIM2 is supported by the latter result as well as by the finding that injecting the antibody (COOH-STIM2) against STIM2 specifically increased the current amplitude by more than 100%, regardless of the agonist used to generate the Tin response. It is known that the COOH region, in both STIM1 and STIM2, contains the domain necessary to interact and activate the SOC channel formed by Orai . Thus, a potentiating effect of the COOH-STIM2 antibody indicates that the strength of the STIM2-Orai interaction might be regulated, either positively or negatively, through a site that is affected by the antibody, indirectly confirming the central role of STIM2 during Tin generation. As expected given the STIM structure proposed, the two antibodies that recognized domains close to the amino-terminus had no effect on the Tin response. Significant inhibition of the maturation process was observed in oocytes devoid of STIM2 protein. Here, we provided clear-cut evidence of STIM2 involvement during or in preparation for maturation, since its absence eliminated the process of GVBD. Once again, this result contrasted with the lack of effect in STIM1-knockdown oocytes, whose maturation was similar to that of control oocytes. Indeed, it has been shown that the function of STIM1 is downregulated during the maturation process, which contributes to elimination of the SOC response in Xenopus oocytes -; a similar condition has been shown in the mammalian oocyte , although in the latter this phenomenon remains controversial . There is no previous information regarding the effect produced by lack (or overexpression) of STIM2 during maturation either in frog or mammalian oocytes, as most previous studies focused on the role of STIM1. However, mouse oocyte is known to express STIM2 protein in the ER; during maturation, STIM2 re-localizes from a homogeneous distribution to one closer to the meiotic spindles, suggesting a role during this process . In frog, is possible that the inhibitory effect of STIM2 knockdown was unrelated to its role in SOCE activation, since meiosis entry in Xenopus does not require Ca2+-influx . Further studies will be necessary to characterize the level at which the lack of STIM2 had such a dramatic effect on the maturation process, and to determine if it might have more general implications. One possibility is that as-STIM2 might cause downregulation of a STIM2 isoform different from that involved in SOCE activation. Another possibility relates to its role regulating cytoplasmic [Ca2+], in which case as-STIM2 might affect the activation of Ca2+-dependent processes required prior to meiosis entry. In this study, STIM2 is fundamental for the endogenous SOC response in the oocyte, although an association with STIM1 seemed to be necessary for its full generation. The mechanism responsible for the clear dependence of meiosis entry on STIM2 expression is a fundamental question that remains open, and its elucidation might help to understand the function of STIM proteins in the Xenopus oocyte and in other cell types as well. B.S.-F. performed experiments, collected data, provided input in data analysis and was involved in drafting the manuscript. F.G.V.-C. and E. G. performed experiments and provided substantial input in design and interpretation of data. R.O.A. designed research, performed experiments and drafted the manuscript. All authors gave final approval to the version to be published. The author’s thank to Dr. Dorothy D. Pless for editing the manuscript. We also thank Mr. Horacio Ramírez Leyva, M. en C. Leonor Casanova, Ing. Ramón Martínez Olvera, and ISC Omar González Hernández, for their expert technical assistance. B.S.-F. as a doctoral student from Programa de Doctorado en Ciencias Biomédicas at Universidad Nacional Autónoma de México (UNAM) is grateful that she received fellowship 215719 from CONACyT-México. R.O.A. received grants by CONACyT-México 82340 and PAPIIT-UNAM-México IN205312, lastly, F.G.V.-C. is grateful for the grants received by CONACyT-México No. 166725 and PAPIIT-UNAM-México No. IN205114.